You know what I’m discovering about myself in 2019?? I actually like organizing. Really, I’m surprising myself here. But I’m starting to get the hang out it and I’m kinda getting hooked. Weird, huh?! Miracles happen my friends. And my organization streak continued this weekend when I randomly decided to go through my entire closet late Saturday night. I got rid of a ton of stuff and then woke up Sunday determined to do even more. 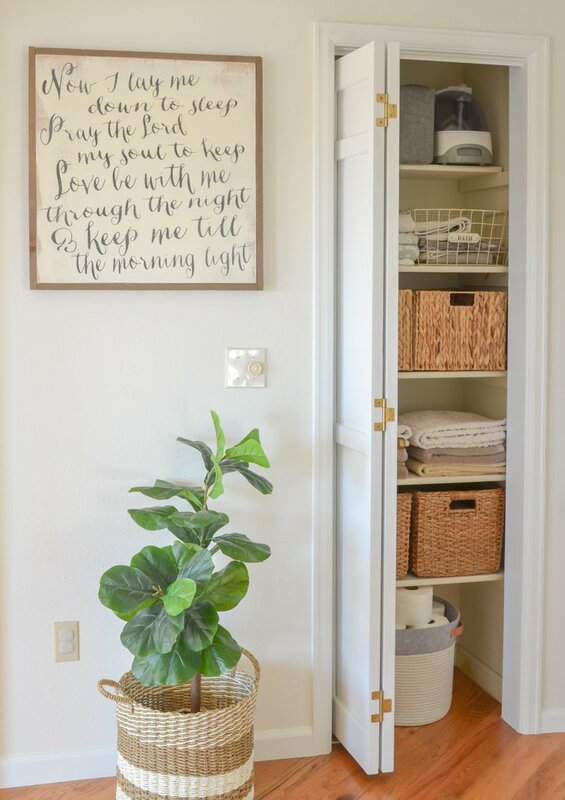 So I tackled our small linen closet and then I got so excited about the finished look that I thought it would be fun to share it with you fabulous humans today! Sound good? I hope so. Ok, let’s start with the before photo. Much better right, huh? 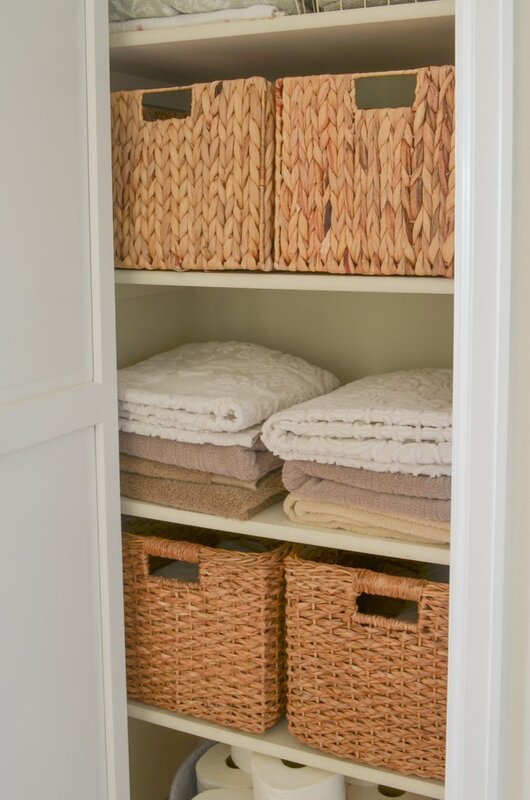 I can’t even tell you how much happiness this little organized linen closet brings me now. I started by taking everything out and then I made a KEEP and TOSS pile. I was shocked to see how many things in this closet we didn’t actually need or use anymore. Plus lots of stuff was just plain worn out and needed to be thrown away. 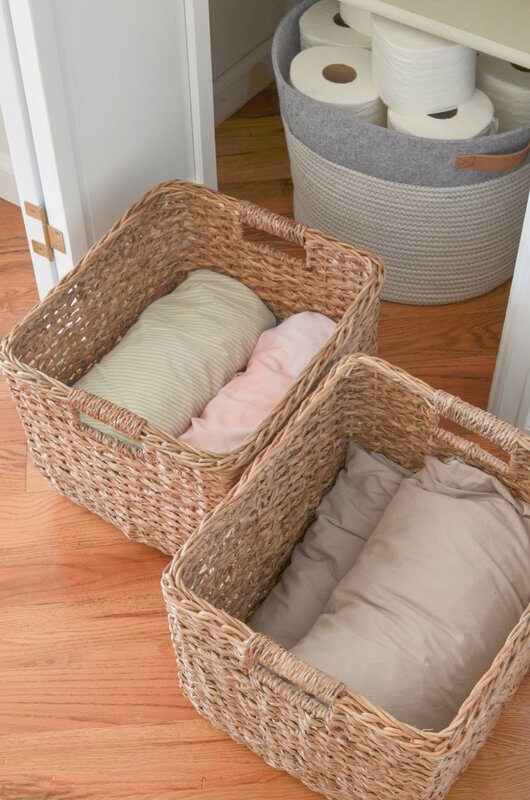 I used large baskets to organize all of the linens. I have one for basic pillowcases, one for decorative/throw pillow covers, and then two for bed sheets. I decided to downsize to just two sets of sheets per bed–which opened up a lot of space in this closet. And I found that rolling the sheets up like little burritos made the fit really nicely into my baskets. 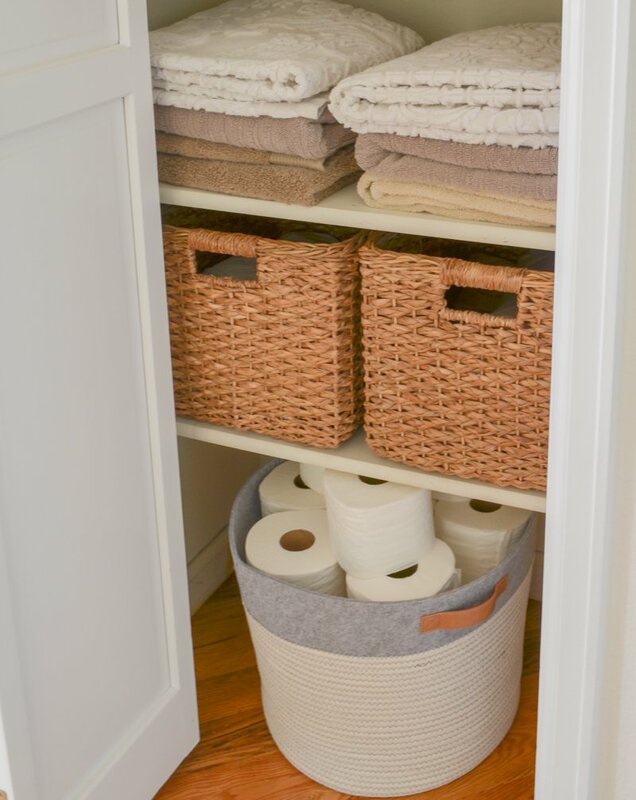 All of the storage baskets are from Target, which is where I also found this super cute large fabric bin for storing extra toilet paper. I had to laugh at myself while I was shopping for this closet makeover because I’ve literally been to the storage aisle at Target more times in the past month than I have in my entire life! Really, I feel like I’m there multiple times a week shopping for more storage bins and I just can’t stop. I’m officially addicted to organizing ALL THE THINGS. Five Winter Decluttering Tips + Printable! It looks so good Sarah! Isn’t it funny how once you get organized you get addicted to it? It’s one of those things that just makes me feel so good! I love your baskets in there, and rolling the sheets is a fantastic idea!🙌🙌 I’m going to try that in mine!! Hi Sarah! Great job on organizing your closet, it looks great! I’m ashamed to say, but mine looks like your before photo, only 10 times worse. I know I’ve got to just hunker down and do it. I’m just so dreading all the decision making that goes along with it, what to keep, what to donate, etc.. I am terrible at decision making and always end up having regrets about something I’ve gotten rid of. The struggle is real, lol! You’ve inspired me, so thanks for that! Have a great day! Thanks for the idea of rolling up those extra sheets and keeping them in baskets. Looks so neat and organized. Great job! Love the new look. I have been organizing my home…. it’s addicting!! I also found rolling the sheets are a great way to store them. I stand mine up so I can see each one. Otherwise I’d just pick off the top and never select the ones on the bottom. Please share more of your organizing journey! 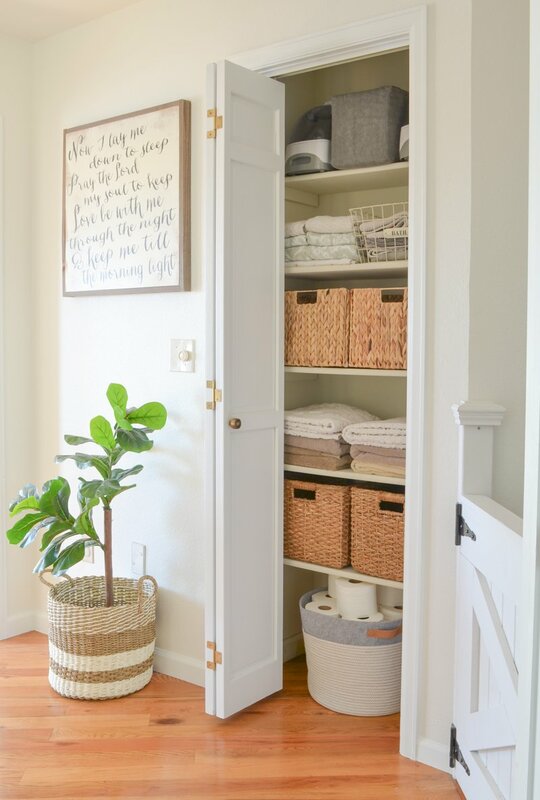 Your linen closet makeover looks great! Lots of great ideas! Love the basket holding the toilet paper so I bought one! Thanks for sharing ! My closet looks exactly like your first photo and usually stresses me out when I look in there! But now I’m totally motivated to do what you did here! Thanks for showing this! Hi Sarah! Your closet looks fabulous!! 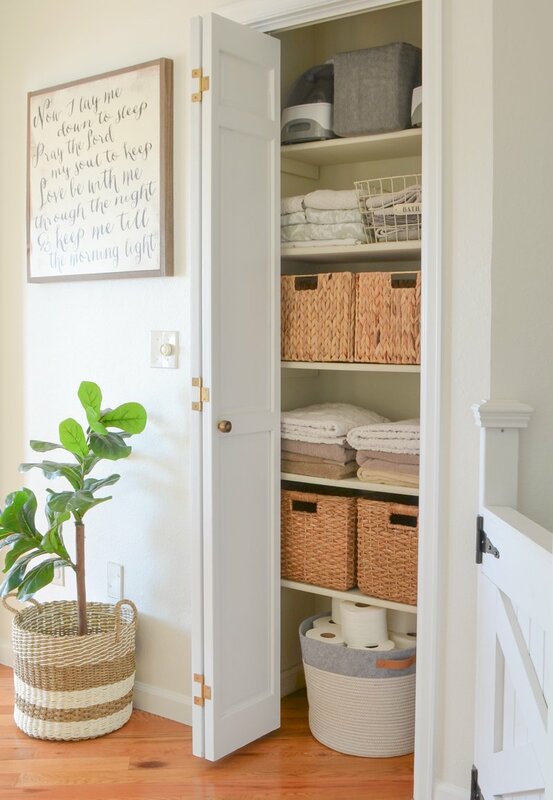 Thank you for inspiring me to get busy and organize our linen closet! Ours is one hot mess! I’m going to try rolling our sheets as well. Thanks again!! Why are YOU embarrassed about that before shot? It just looks like you came and took a picture of OUR linen closet!! You have now inspired me to clean mine out because it looks way worse than your! Also where did you get the picture next to the closet! I don’t have a linen closet I have a dresser for sheets and table clothes and a cedar chest for blankets and comforters. Looks fabulous! I adore baskets like that. I’m working on turning our spare room/office/sewing room/dumping ground into a pretty organized space and plan to use basket and storages in shades of brown/tan on a large black wire shelving unit to make it look more cohesive and attractive, instead a hodgepodge of random containers in various colors and materials that looks messy and cluttered. Thanks for the inspiration! First of all, I love the before photo! Makes me feel better about my closets! Haha! But seriously, well done on the closet organization. 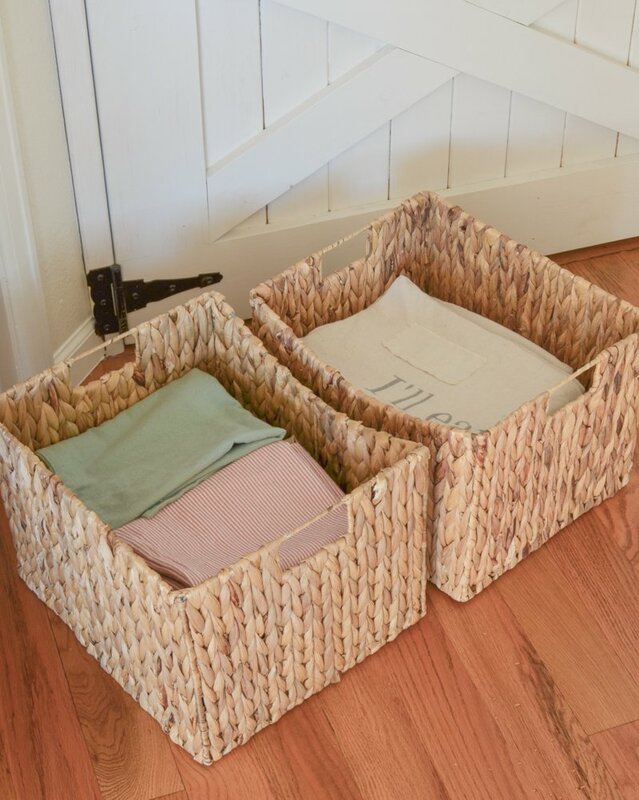 I’m also a bit obsessed with buying storage bins right now too, I may soon have to declutter my storage bins! I’m inspired again!! 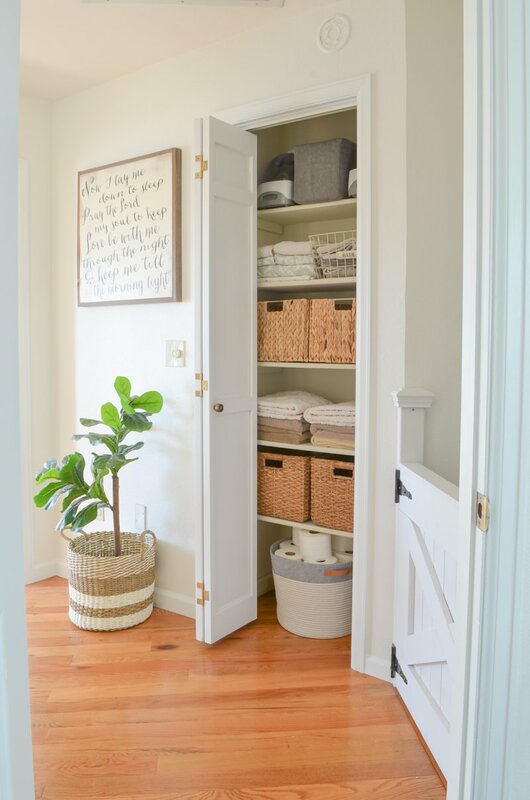 I have a closet very much like this one in the hall for linens, and another of similar size in the main bath. BOTH have been ignored for years and are crammed with stuff I don’t need (like 2 dozen pillowcases or 27 hand towels!). Tomorrow is supposed to bring 7+” of snow followed by freezing rain, so guess what I’ll be doing? Thanks for the inspi Sarah! Hope mine turns out as nice as yours! What I would do with your towel shelf is face the rounded fold! Cleaner look! I always make a point of doing that too. Isn’t it funny!! You’re right, it just looks better. And it would annoy the heck out of me if done the other way! Omg yes!! 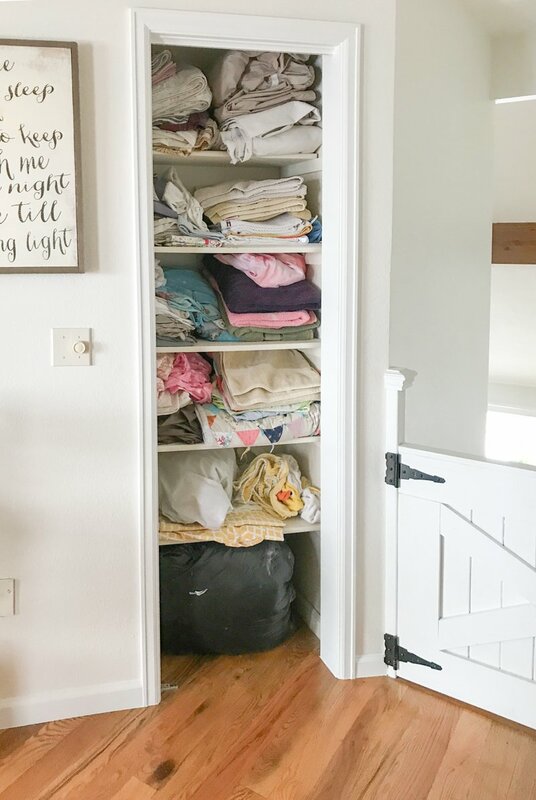 This totally has Marie Kondo vibes allll over it! It looks so good! I have done this so many times, and like you I am always so amazed at how great it looks, when I am done. Your closet is fabulous. You home is going to be the wonderful, You will able to find anything you need. Great job, you should be so very proud!! I don’t think it looked that bad before.But, it does look great now! I definitely need to work on our closets too! Thanks for the inspiration. I watched the Marie Kondo series and definitely want to implement, but it is tough to find time on top of the daily grind with kiddos. It will get done eventually… progress being made..slowly. Would you share your wall colors with me? Could use some help !! This is Alabaster by Sherwin Williams! This looks fabulous! You’ve inspired me to tackle some spaces that need organized in our home. Thanks!